Surprise is a powerful tool of architecture, having the potential to create memorable experiences. Architects Daniela and Daniel Mazeiro restored the small poorly maintained 1929 Art Deco house on Euclid Avenue for their family of four. The cubic form with its streamlined porch elements was the last home built on this block of traditional style buildings. To meet the needs of their young family the couple designed and built a two-story addition containing on the first floor a mudroom, family room with a slate fireplace open to the sunny breakfast room and a modern kitchen with a monumental island. On the second floor accessed via a short bridge of steel, glass and wood, they planned a private master suite with a glassy bedroom, his and her dressing rooms and an elegant sky lit bath. The building program is common to the needs of many of us who live in vintage homes. 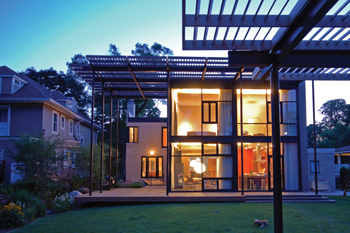 Rare in Oak Park, the modern two-story addition is framed in steel and predominately built of glass and ground face concrete block with a geometric Mondrian window pattern. Primary colors on the interior are repeated on the exterior as the two-story garage is painted a bold red. The stucco auto pavilion or "man cave" is asymmetrically rendered with abstract patterns and 3Form cast glass windows. The translucent glow at night creates interest from the main house. Lighting set on a timer makes the windows glow. Adjacent to the auto-cube, the architects have placed a one-story open sitting pavilion scaled to be a miniature of the two-story main house. This intimate lounge with fire pit and cushioned modern furniture is the perfect place to gaze back to the spectacular surprise of the main house and catch the sunsets beyond. This conscious extension of the interior to every edge of the lot elevates the composition to feel both intimate and heroic. The two-story glass cube is crowned by a dramatic flat louvered shade asymmetrically attached to shade the interior and the wrap-around cedar terrace. The shading device is supported by seven oh-so-slender steel pipe columns that immediately remind me of the Modern Wing at the Art Institute by Renzo Piano. The grid of columns and cantilevered trellis are stunning, a welcome contrast to the Victorian homes on either side. The louvers are planned to provide shade in the summer and filtered sunlight in the winter, addressing a basic sustainable solar issue. All of the rooms open to a perfect rectangular green surrounded by lush plantings to soften and provide privacy. I love how the house extends and embraces the garden. The building program is typical for Oak Park/River Forest vintage properties with our need for more space in the form of a kitchen open to a family room, a powder room and a master suite upstairs. Yet, there is nothing typical about this solution brought to high-art. This is architecture at its best — a surprise that does not disappoint. The carefully restored Deco home to the modernist glassy cube, to the refined landscaping and elegant interiors; the Mazeiro residence is a building to admire and inspire. A wonderful example of how preservation and invention can dance without stepping on anyone's toes. Our village deserves more of this quality architecture. Garret Eakin is an award winning residential architect, a preservation commissioner, and an adjunct professor at the School of the Art Institute.